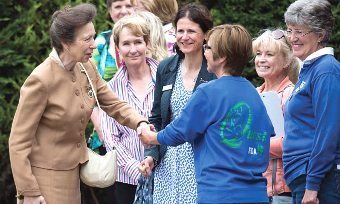 A VISIT from the Princess Royal was the crowning moment in what has been a rewarding year for an intrepid Chobham-based charity. 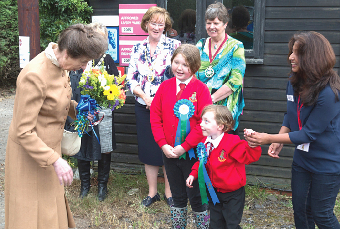 Princess Anne was joined by other Surrey dignitaries to hail the exceptional work of Quest RDA at Laris Farm, in Windlesham Road. Quest was founded more than 40 years ago by a group of people who were determined that disability would not be a barrier to their enjoyment and the therapeutic benefits of horse-riding. 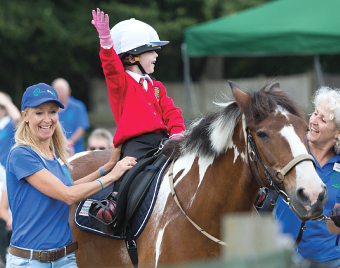 Over the years the founding group have been followed by a small army of volunteers, who have served Quest and have never lost sight of its founding aspiration to improve the lot of disabled people through the opportunities that horse-riding can bring. HRH Princess Anne, who is a patron of the organisation, made her visit on Tuesday last week and took her seat among riding instructors and family and friends to watch some of the charity’s youngsters do what they do best in the saddle. Four riders from as many riding schools thoroughly stole the show, for which the Princess took on the role of prizegiver and presented the volunteers with some very well-earned long-service awards.